Remember Crackle, the free streaming service you never use? Well, they're breaking into the exclusive content game starting with video game adaptation Dead Rising: Endgame, which will premier June 20th on the free service. Directed by Pat Williams, DEAD RISING: ENDGAME is based on the hugely popular Dead Rising video game franchise by Capcom, which has sold over 9.1 million copies worldwide. 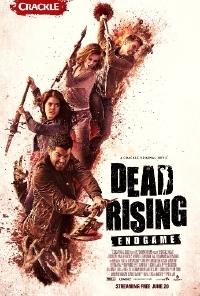 DEAD RISING: ENDGAME drops us into the zombie-infested quarantined zone of East Mission City where investigative reporter Chase Carter (Jesse Metcalfe) must stop a secret government conspiracy which, though seemingly aimed at ending the countryâ€™s zombie epidemic, will also kill millions of innocent civilians. The show stars Jesse Metcalfe (â€œDesperate Housewives,â€ â€œDallasâ€), Billy Zane (ZOOLANDER 2, TITANIC) Dennis Haysbert (â€œ24,â€ Sin City: A Dame to Kill For, Wreck-it Ralph), Marie Avgeropoulos (â€œThe 100â€), Jessica Harmon (â€œiZombieâ€), Keegan Connor Tracy (â€œOnce Upon a Time,â€ â€œBates Motelâ€), Ian Tracey (â€œBates Motel,â€ MAN OF STEEL), Victor Webster (â€œGirlfriendsâ€™ Guide to Divorce,â€ â€œContinuumâ€), Camille Sullivan (â€œThe Man in the High Castleâ€) and Patrick Sabongui (â€œThe Art of Moreâ€). Dead Rising: Endgame premiers on Crackle on June 20th, 2016. God, not another "the US Military is Evil" plot! I mean is Hollywood or whoever so out of ideas that they have to keep slopping up this lame narrative? You know who is in the military? Someones brothers, sisters, mom and dads and uncles, etc. In other words just normal people. They are not cold blooded murders. Fear the Walking Dead did the same thing as far as showing the Army as idiots or something and they are not. I like Zombie movies but this really turns me off.